Tomb Raider III: Adventures of Lara Croft is a platform and third-person shooter game, and the third game in the Tomb Raider series. It was released for the PlayStation and Windows in 1998. Millions of years ago, a meteoroid strikes Antarctica. In the present day, a corporation called RX Tech excavates the site, and finds that the meteoroid rock has strange properties. 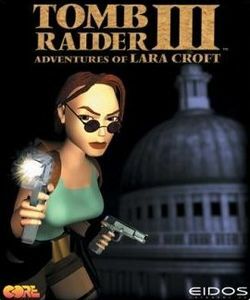 When the game begins, Lara Croft is searching for the artifact in the ruins of an ancient Indian temple once inhabited by the Infada tribe. She encounters a researcher working for RX Tech who appears to be insane. After parting ways, the researcher beats Lara to the Infada Stone, gaining supernatural powers. After killing him and taking the artifact, Lara is approached by Dr. Willard, the head of RX Tech, who explains the origins of the Infada Stone. Thousands of years ago, Polynesians came across the meteoroid crater and found that it had incredible power. Using rock from the meteoroid, they crafted four stones, one of which is the Infada Stone. They then fled Antarctica, but, in the nineteenth century, a group of sailors travelling with Charles Darwin came to Antarctica and discovered the artifacts. The four stones were then distributed across the globe. Dr. Willard has been able to track the artifacts by using the diary of one of the sailors. Lara agrees to help find the other three stones. This page was last edited on 1 June 2016, at 21:12.